When I was 14 my dad took me to a Seattle Mariners baseball game when the Boston Red Sox were in town. We crossed the border from our Vancouver home, drove the 2 hours south, down the coast to the brand new Safeco field right in downtown Seattle. But on this day we weren't there to see my favorite team the Mariners, we came out to watch the Red Sox starter, Pedro Martinez. My dad being the pitching guru he created out of himself, he naturally found Pedro a great pitcher to watch a learn from. In his prime at that time, he featured a upper 90's fastball, a change up around 87 MPH, and several other pitches, with the movement and location on all of his pitches being his best assets. He dominated the Mariners on that day and my dad and I had front row seats (almost literally) to the Pedro show that year when he had a career year winning 23 games, with over 300 strikeouts. 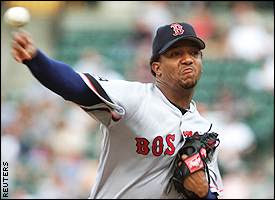 On March 7th, we play the Dominicans, and guess who's a pitcher on their roster, yep, the now veteran without a major league club, Pedro Martinez. Both Perdo and Randy Johnson were my idols growing up. The way I now pitch, I can see some of both of their styles in how I throw (except the explosive fastball). I like to think I have the movement and location of Pedro, with the right handed-version of Randy Johnsons' arm angle and an attempt at his slider also. If I get a chance I might head out and get an autograph from Pedro during batting practice. I know... I know, it's weak-sauce, but he is and was my idol, so I might turn back into that 14 year old, and say hi to him, we'll see.